Hide deals from seller "CubsPoster.com"
Hide deals from category "Collectibles"
Limit 1 per person. Valid on a 21”x21” Cubs poster. Shipping fee of $8 not included. Promotional value expires 60 days after purchase. Own a piece of Cubs history with 50% off original artwork by Frank Schiefelbein from CubsPoster.com ($100 value). 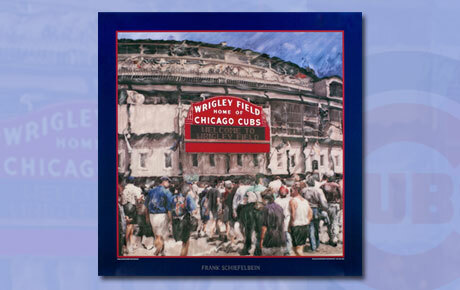 This 21”x21” poster features the iconic Wrigley Field on opening day in 1996. Frank Schiefelbein has created a unique vision of The Friendly Confines. The poster was made using a Polaroid photo taken and hand-manipulated by Schiefelbein, giving it the look of a masterful oil painting. Displayed prominently in the poster is the world-famous Wrigley Field marquee that bids spectators welcome to the oldest ballpark in the National League. This limited-edition poster is hand-signed by the artist, making this piece of Cubs memorabilia worthy of any enthusiast’s collection. Chicagoland artist who has created a distinctive representation of Wrigley Field.